Many thanks to all for taking part in my first competition of the year. 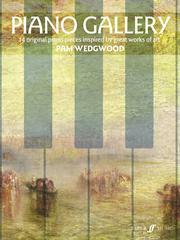 The prize is a copy of Piano Gallery, a new collection of 14 pieces written by Pam Wedgwood and published by Faber Music. Congratulations! Please send your address via the contact page here on this blog, and your book will be on its way. More competitions coming soon! For more information on Piano Gallery, click here.